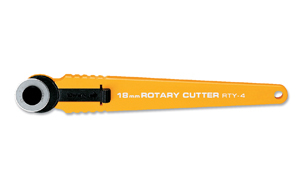 OLFA Rotary Cutter RTY-4 Model 9657 is an 18mm Rotary Cutter that is perfect for intricate quilt work and small curve cutting. Small enough to get around all those tight curves, yet sharp enough to handle the toughest materials. Try it on your next applique or minature quilt project, use it for cutting curved quilt pieces, cut templates like a breeze and trim seams in no time. This cutter also accomodates the PRB-18 perforation blade great for cutting, ticket-making and scrapbook designs. Accommodates both right and left handed users. Comes with 1 RB Blade. Uses RB18 and PRB18 replacement blades only. Perfect for curved piece quilting, applique, trimming seams, template cutting, scrapbooking and miniature quilting. 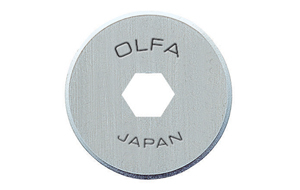 OLFA Handles Are Guaranteed Forever.